A range-restricted (EOO 2142 km²), localized habitat specialist. Fewer than 10 subpopulations are known, with the population size estimated to be fewer than 1000 mature individuals, but stable. Koue Bokkeveld and Hex River Mountains. Marshy areas or swamps with seasonally standing water near mountain summits, often localized to shale bands, 1450-2000 m.
Potentially threatened by too frequent fire (this species is a reseeder killed by fire), as well as climate change-related drought. It is likely to be dependent on permanent underground water sources (Linder 2011). This species is rare and localized to suitable habitat, and is known from less than 10 subpopulations, which are most often small, consisting of fewer than 50 mature individuals. 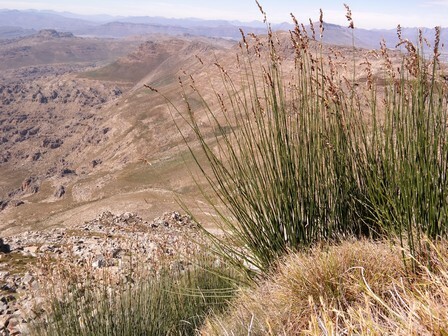 The only extensive subpopulation is on Matroosberg in the Hex River Mountains, and the population size is estimated to be less than 1000 mature individuals (N.A. Helme pers. obs.). Linder, H.P. 1985. 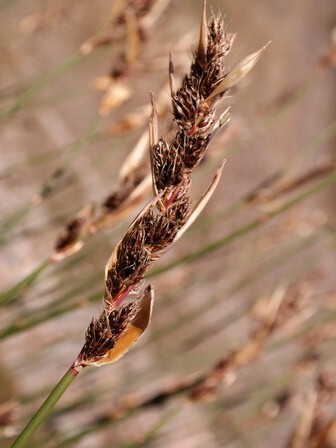 Conspectus of the African species of Restionaceae. Bothalia 15(3&4):387-503. Linder, H.P. 2011. The African Restionaceae: an Interactive Key identification and description system. Version 6. http://www.systbot.uzh.ch/Bestimmungsschluessel/Restionaceae_en.html. Downloaded.